In one of the wettest tropical rainforests in the world, in westernmost Colombia, WLT has helped purchase 124 acres (50 hectares) of threatened Chocó forest, creating the Rana Terribilis Amphibian Reserve. Its creation was supported through generous donations from Puro, an organic Fairtrade coffee producer that has been a long-term WLT corporate supporter. The reserve is now owned and protected by our partners Fundación ProAves. Living in the rich undergrowth of the reserve is a healthy population of Endangered Golden Poison Frog, one of the most extraordinary creatures on the planet. Just 55mm in size, but one of the largest poison dart frogs from the Dendrobatide family, this tiny vibrant creature carries a single milligram of toxin – a small but lethal dose. A single frog could hold enough poison to kill about 10 humans. The frog’s skin is drenched in alkaloid poison (batrachotoxins) that prevent nerves from transmitting impulses, leaving the muscles in an inactive state of contraction – leading to heart failure. Death comes within minutes. The species has long been recognised by indigenous cultures for its lethal poison and is strongly embedded within cultural traditions. The Choco Emberá Indians use the frog’s toxin as poison in their darts used to hunt food; by gently brushing the tips of arrows and darts on the frogs back, without harming it, the weapon can keep their deadly effect for over two years. Yet the frog’s poison is entirely for self-defense and humans pose a much greater threat to the species with a weapon that their toxins cannot defend against – bulldozers. 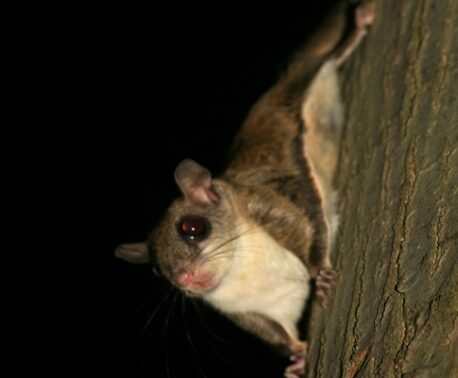 Habitat damage and destruction is the major threat to the species’ survival and improved security in the region has increased deforestation, illegal gold-mining (an estimated 100 bulldozers and excavators are destroying the area), illicit coca cultivation and logging. 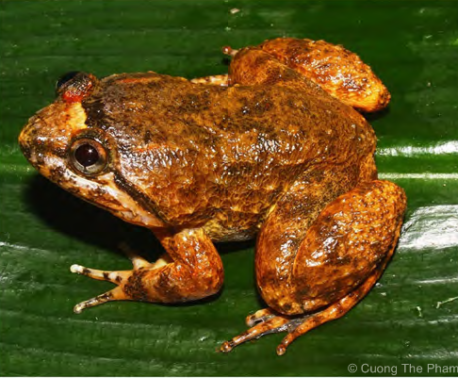 Despite this frog’s infamous reputation and its importance to indigenous cultures, it is considered by many to be on the edge of extinction and until now the species was completely unprotected. 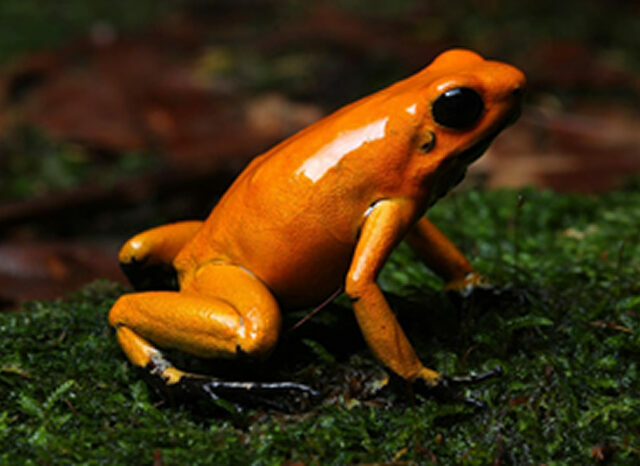 Dependent on primary forest, the Golden Poison Frog occurs patchily across less than 150 miles2 (250 km2) of rainforest on the narrow Pacific coastal plain of the Chocó in western Cauca Department of Colombia. Acclaimed journalist Simon Barnes, a WLT council member, wrote in The Times newspaper in September 2011: “Astonishing: we are on the edge of wiping out one of the most extraordinary and thrilling creatures on the planet. No matter how well a creature is protected by nature and by evolution, it is always vulnerable to humans.